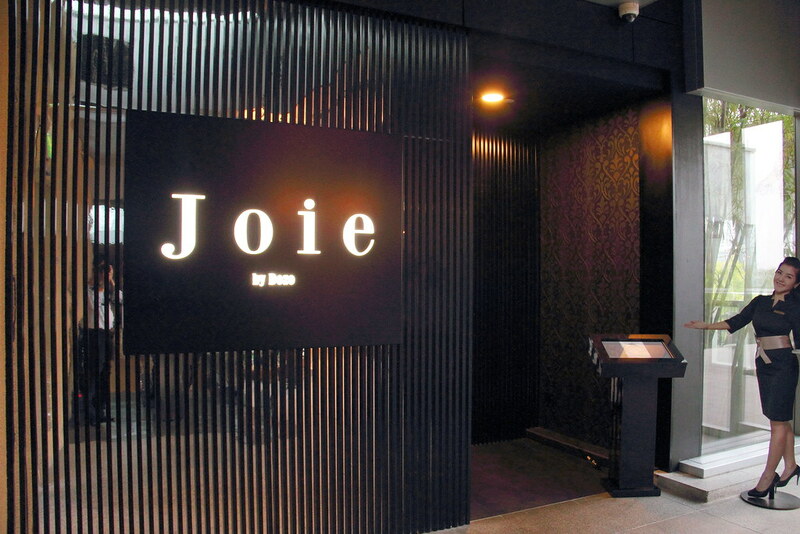 Joie by Dozo located at Orchard Central is a concept by owner Mr Huang that has been brewing since 2011. 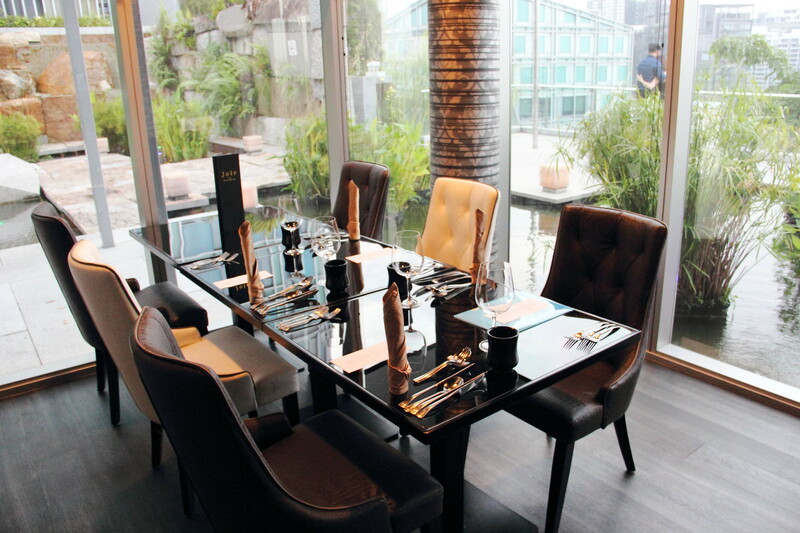 The restaurant has finally opened its door in October 2014 offering fine dining vegetarian. 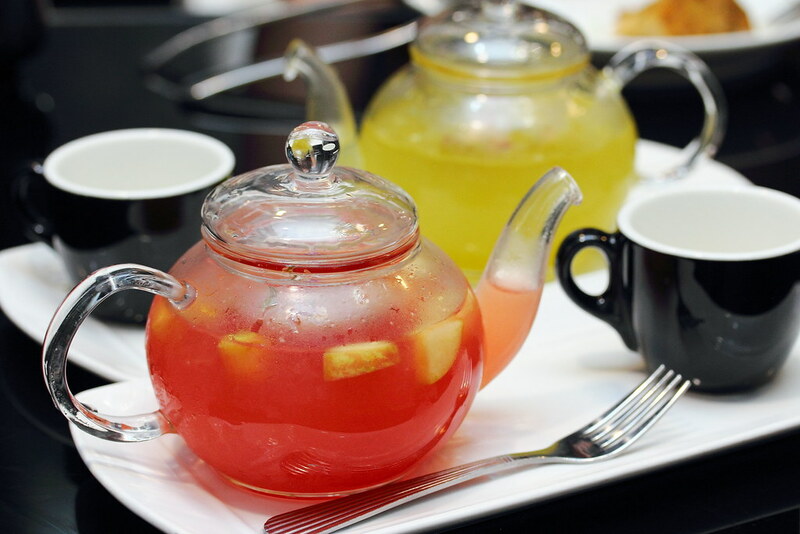 Recently the restaurant has refreshed its new menu after gathering feedback from the customers. 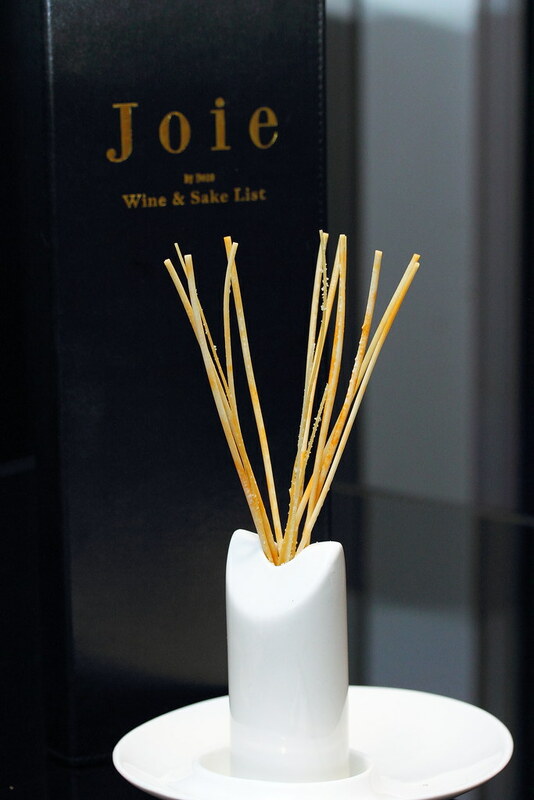 Besides the ala carte menu, Joie also offers a 6 course lunch at $36.80 and 7 course dinner at $68.80. The different between lunch and dinner is one cold dish less. 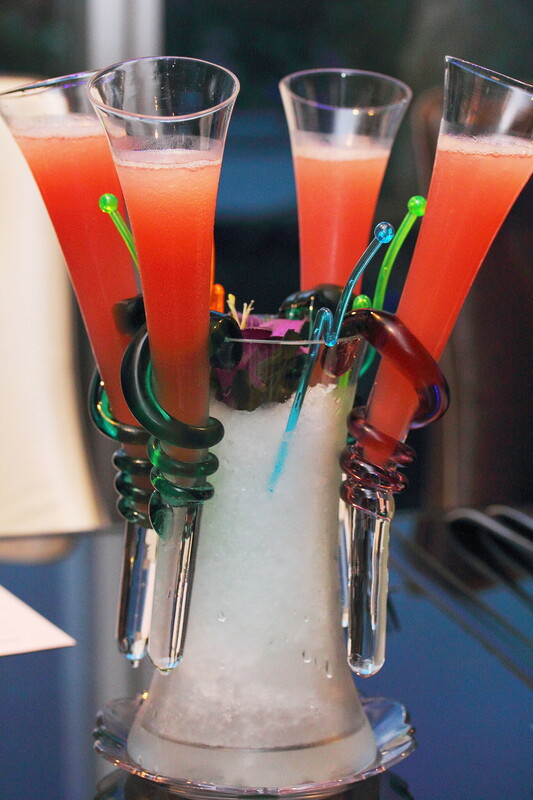 A complimentary and refreshing Cranberry Sorbet drink is served to kick start the gastronomic journey at Joie by Dozo. The 7 course dinner started with a trio of the Chef's Selection of Assorted Platter. 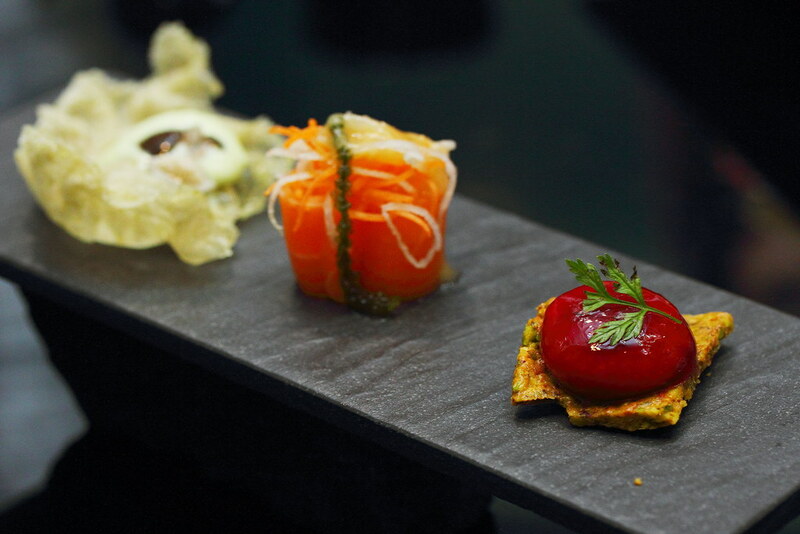 On the plate, there is the Cranberry Sphere, Carrot Sashimi, and Cracker with Wasabi Mayo Honey. I find the cranberry sphere tasted more like a dessert. However the carrot sashimi brought me to another culinary world with its flavour and texture that is almost like real salmon. The second course which is a side dish, comes with a choice of Gratinated Champigon with Mozzarella and Tempura Platter on Mash. 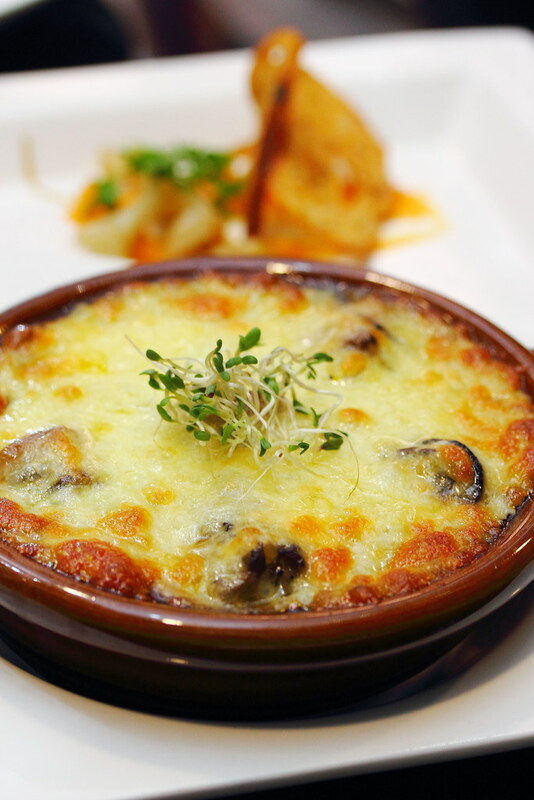 The Gratinated Champignon with Mozzarella is an enjoyable and addictive rendition of the escargot substituted with the champignon mushroom. 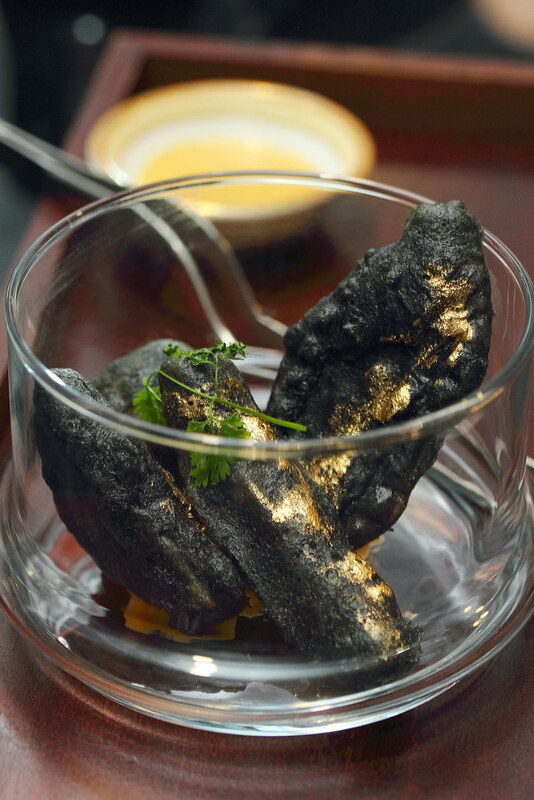 Simply love the presentation of the Tempura Platter on Pumpkin Mash as black charcoal. The vegetable tempura consist of yam, banana, apple and eggplant. The thin batter gives the fruit and vegetable a nice crisp in texture but not overshadowing the taste of main ingredient. Moving on to the third course, there is a selection of Vegetable Sashimi on Ice with Quail Egg Shooter Glass, Tartare Platter au Naturel or Zucchini Tower. 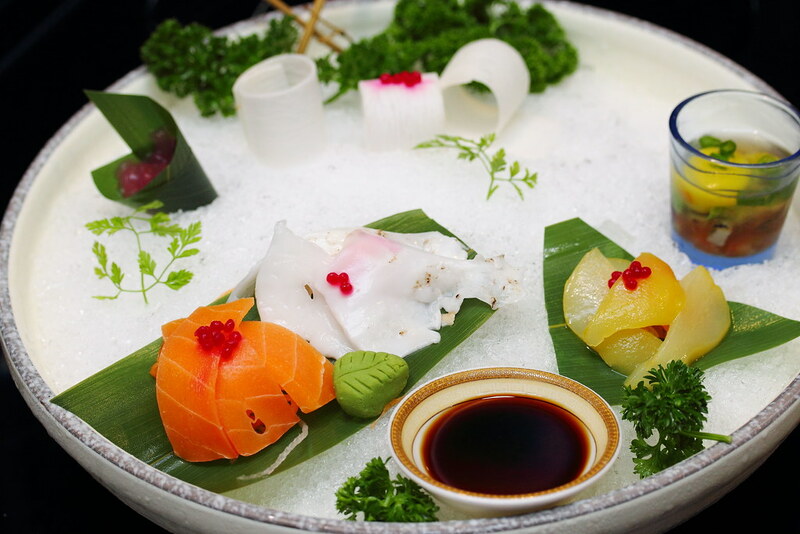 The impressive Vegetable Sashimi on Ice consists of Carrot, Coconut, Orange Pear, Rose Aloe Vera, Chinese Wild Yam and Quail Egg. I did not fancy the rose aloe vera and chinese wild yam but the carrot sashimi and coconut flesh are delicious and interesting substitution. Mentioned earlier, the carrot sashimi is very unique, I wonder how it manage to achieve such texture that is almost similar to salmon. The quail egg shot in my opinion is kind of out of place and did not complement the set up of the whole dish. 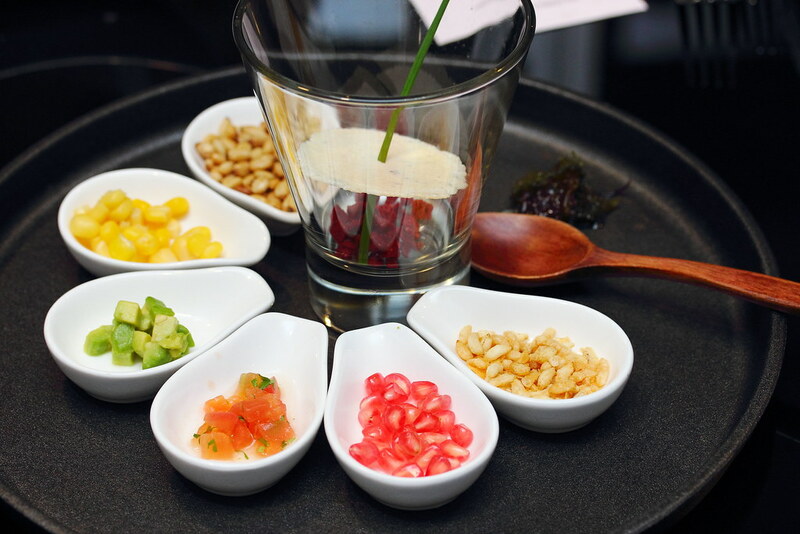 The Tartare Platter au Naturel is a healthy resemble of the tartare using a mix of rice cracker, promgenate seeds, tomato salsa, avocado, corns and pine seeds held together by the parmesan cheese. Pour them all into the glass and give it a good mix to enjoy a whole party of different textures. 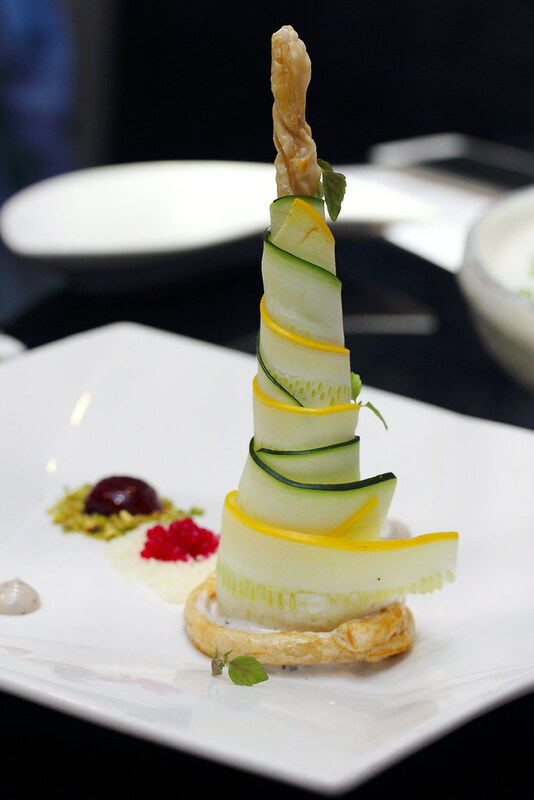 The Zucchini Tower wrapped around a towering pastry stood tall but did not impress me. While the zucchini comes across as light and refreshing, I did not really know how to appreciate it further. 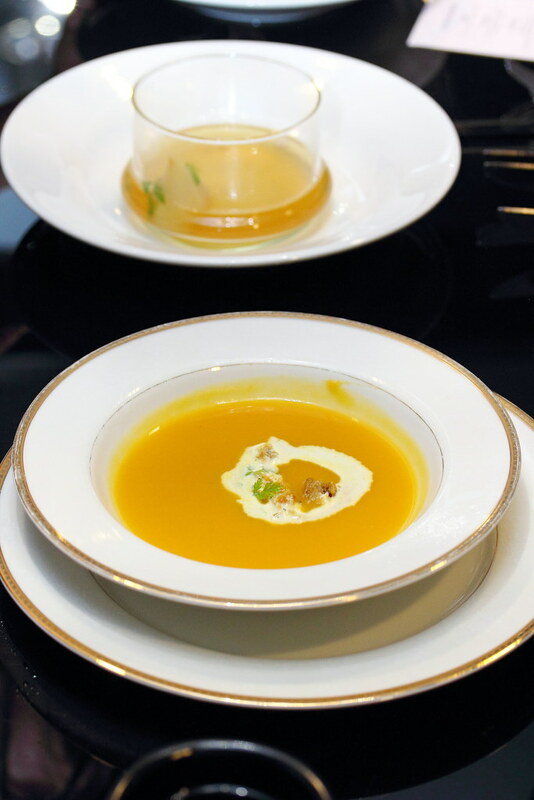 For the fourth course, diner has a choice of 4 different types of soup in the Infusion of Cepes and Truffle, Clear Tomato Broth with Garbanzo, Pumpkin Veloute or Snow Pear and Napa Cabbage Consumme. 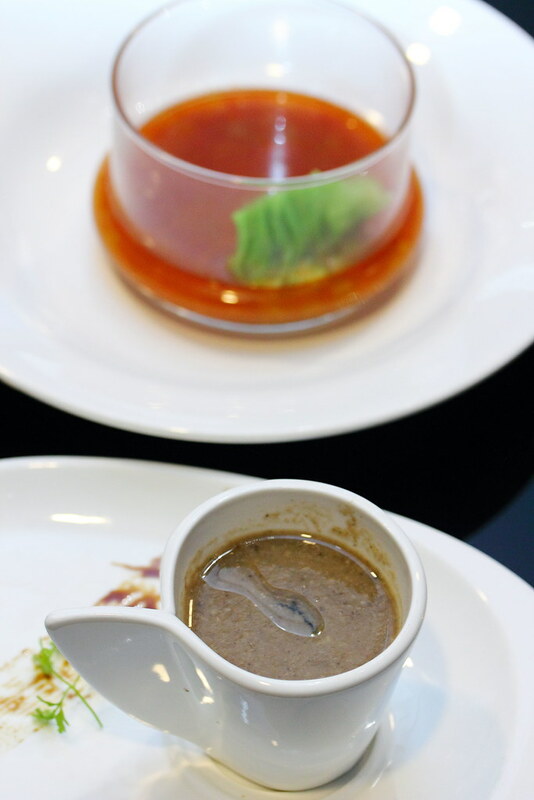 If you are inclined to more western style of soup, I would recommend going for the Infusion of Cepes or Pumpkin Veloute. For mains there are three choices in the Grill Bai-Ling Steak on Pu Ye Hot Stone, Duo Ravioli Platter and Wild Rice with Eggplant Terrine. 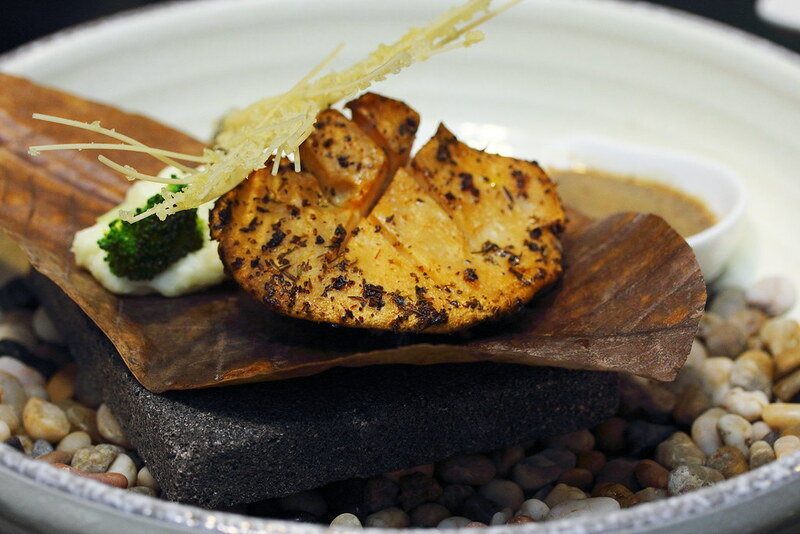 Having dine in Dozo before, the Grill Bai-Ling Steak on Pu Ye Hot Stone is a vegetarian interpretation of Dozo's signature dish. Plump, juicy and sweet, this will be a delightful mains for any vegetarian. 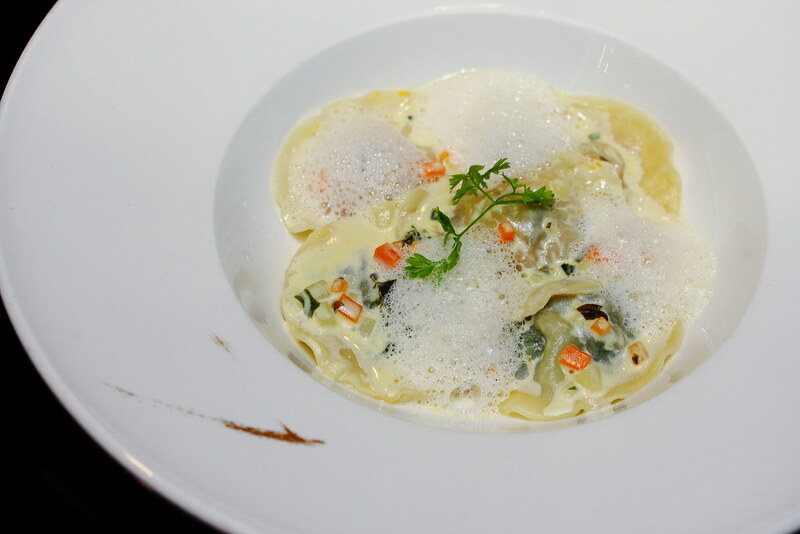 The Duo Ravioli Platter with Truffle Foam comes with ravioli stuffed with either spinach or pumpkin. I preferred the spinach over the pumpkin. I felt the sweetness of the pumpkin tilted the balance of the whole dish. 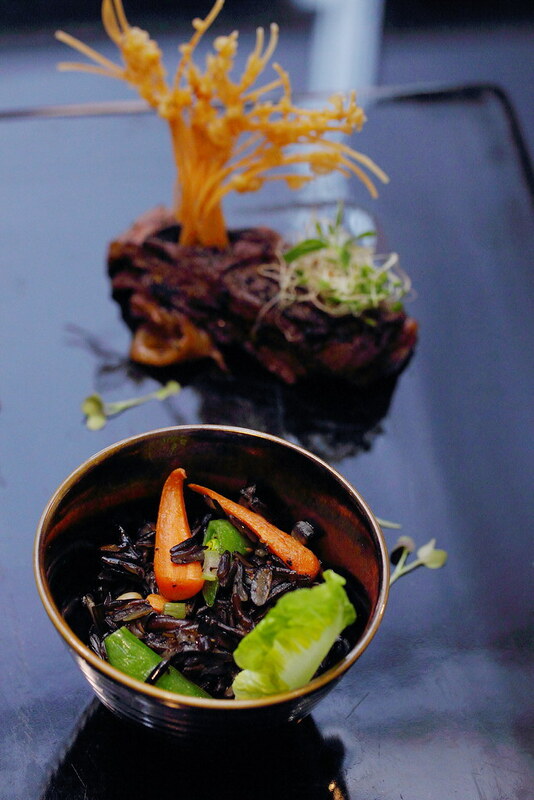 Dull in colour but not dull in taste, the Wild Rice with Eggplant Terrine is a hearty meal itself. The crunchy wild rice and the flavourful eggplant terrine will make it a fulfilling meal. 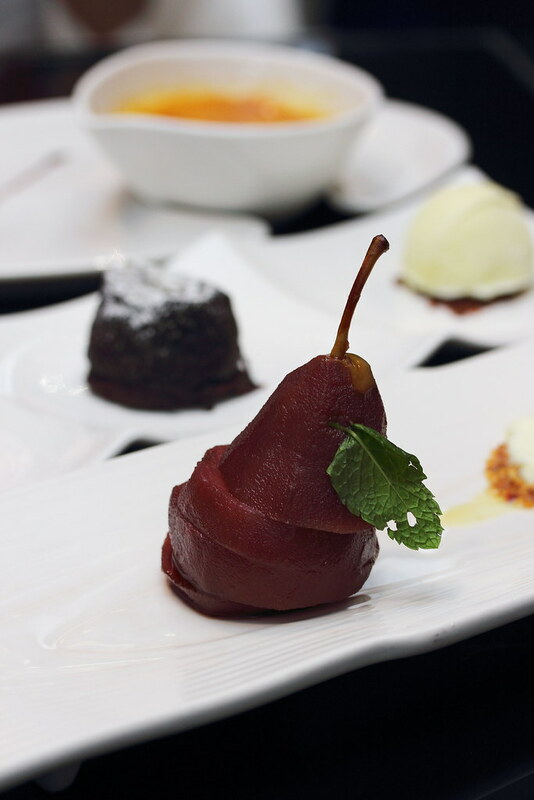 End the dinner experience with some sweet dessert in the Red Wine Poached Pear with Vanilla Ice Cream, Warm Chocolate Cake with Vanilla Ice Cream or Coffee Creme Brulee. All are reasonable good but I probably recommend Red Wine Poached Pear with Vanilla Ice Cream, a little from the norm. Wrapped up the 7 course dinner menu is a choice of hot and cold beverages. 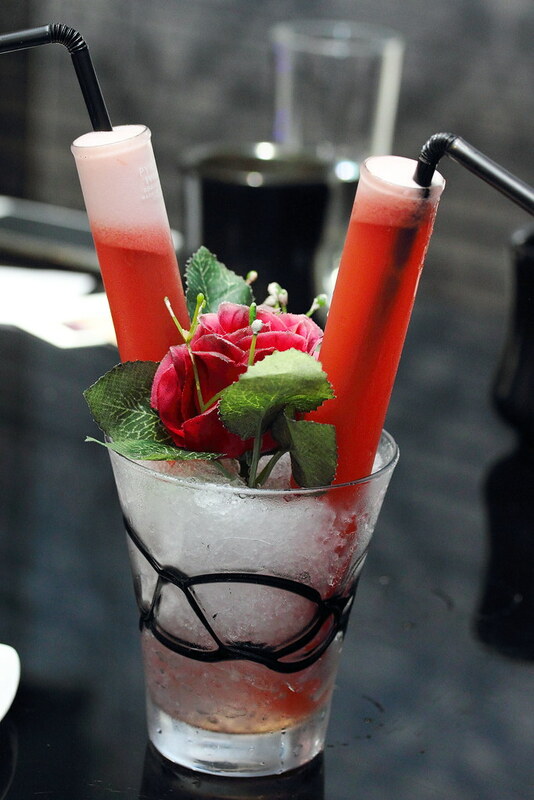 The Mocktail of Love is not only refreshing but also a good palate cleanser. 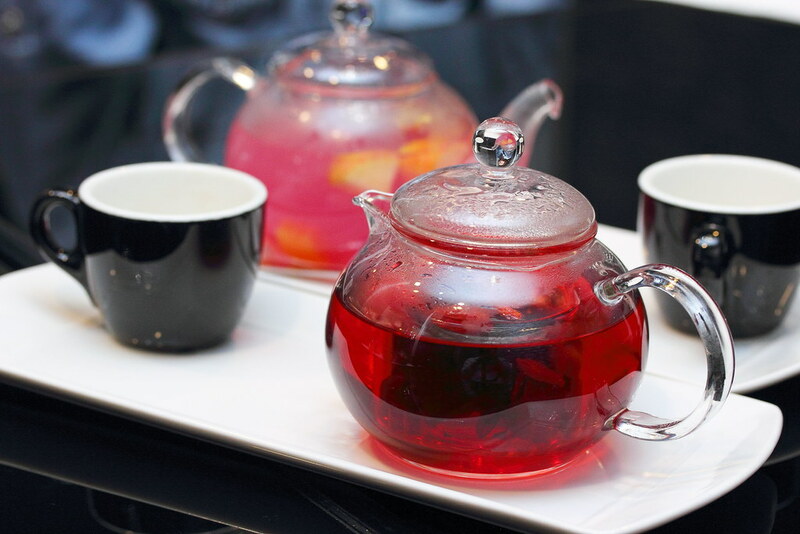 If you are a tea drinker, a selection of Ice Fruity Refresher, Ice Rose Lemon Tea, Iced Mallow Apple Melody, Hot Roselle Rhythm and Hot Lavender Tea will arouse the senses for a smoothing end for the night. Indeed and imagine all these are vegetarian. The set course is also quite reasonable priced.